To me this card screams spring and sunshine and I could sure use it on a cold and dreary day like today! I decided to play along with Mojo Monday (http://mojomonday.blogspot.com/). The base of this card is Basic Gray and I used three shades of yellow, So Saffron, Daffodil Delight and Crushed Curry. 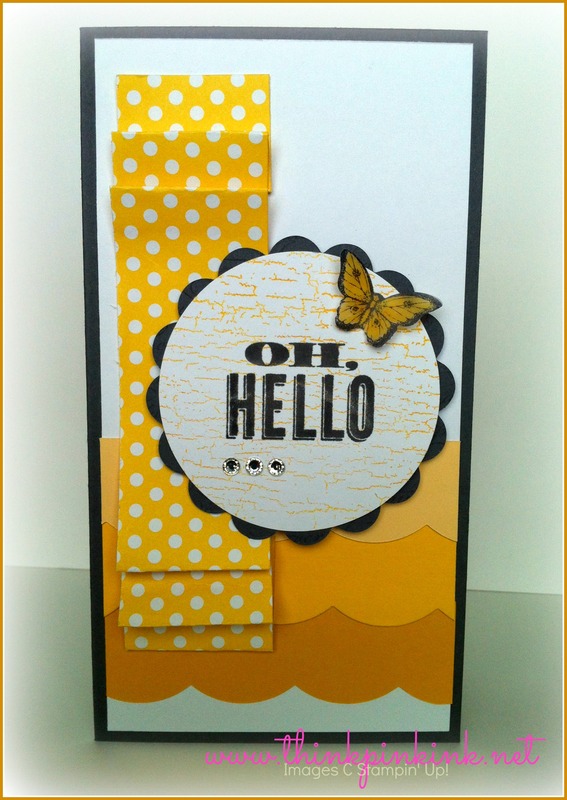 The DSP is Polka Dot Parade and the sentiment is from the “Oh, Hello” set. I’m loving the rhinestones and velum butterfly! And I went old school, that crackle stamp under the sentiment is a SU background stamp from 2005! Tagged Daffodil Delight, MOJO334, Oh Hello, Stampin' Up!